PING have always applied science to produce performance, relying on empirical evidence to make their clubs category leaders in every sense of the word. This resolute focus has meant PING have often been cautious when introducing new technology into their clubs: unless they can prove it will boost performance, they’ll give it a miss. With that in mind the new PING G410 driver marks a significant milestone for the company because it’s the first PING driver to feature an adjustable weighting system. And given it’s been 15 years since the first adjustable CG (centre of gravity) driver was introduced to the game, you can be assured that the figures will stack up for the PING G410 driver. So what prompted PING to finally introduce weight adjustability on the G410 driver? Sixty-six per cent of their Tour players requested some form of internal weighting in the previous G400 driver to alter the CG. That meant PING had to customise their drivers by melting some additional metal inside the club head to produce the shape their players desired. PING obviously had to meet the demand for CG adjustable drivers but they weren’t prepared to throw the baby out with the bath water. They were adamant the moment of inertia (MOI) of the new G410 wouldn’t be sacrificed to enable CG adjustability. The MOI – a measurement of a club’s stability and resistance to twisting - is a crucial factor in a driver’s forgiveness and PING take it very seriously: every PING driver ever released has borne an MOI which exceeded its predecessor. So the PING G410 driver had a monumental task to better the MOI of the previous G400 driver, as well as sprouting a weight adjustability system. Taking over from the PING G400 driver, the G410 is slightly bigger than its predecessor with a 455cc head in comparison to the G400’s 445cc. But what’s immediately noticeable is the different placement of the weight track channel: it runs around the extreme perimeter of the club head rather than the sole, as seen on comparable drivers. Positioning it on the outer limits is advantageous for the MOI and as promised by PING, there is no sacrifice: the G410's MOI actually exceeds the G400 driver. A 16g weight can be placed in three positions along the tracking channel - neutral, fade and draw – and it can be removed and relocated manually using a tool. While the tracking system might appear somewhat rudimentary, it saves weight by avoiding the need for a complex structure internally. The weight will produce 10 yards of bias when set in the fade or draw location (for a total of 20 yards of assistance between the two positions). There is also a draw-biased PING G410 model, denoted by the SFT designation (straight flight technology). While it doesn’t have the moveable weight like the G410 (which is known as the PLUS model), the SFT has a permanent tungsten weight set in the rear to produce 50 per cent more heel-side CG bias to help shut the club face through impact. A thin TS9+ titanium face provides explosive ball speeds through its flexibility across the width of the G410’s club face and works in conjunction with a new “creased crown” that stiffens the body of the driver. The crown also features PING’s Dragonfly technology, which thins out the weight high in the driver and shifts it to the sole to optimise the CG, while new “turbulators” direct air over and around the driver more efficiently and aid alignment at address. The PING G410 PLUS comes in lofts of 9, 10.5 and 12 degrees while the G410 SFT is only available in a 10.5 degree loft. A new 8g counterbalanced Alta CB Red 55 shaft is among the choice of stock shafts that can be fitted to the PING G410 driver, along with an Alta Tour 65, Project X EvenFlow Black 75 and a Mitsubishi Tensei CK Orange 60. A new adjustable hosel with eight settings makes its debut on the PING G410 driver. It has three new loft/lie settings and offers larger loft adjustments of plus or minus 1.5 degrees. The new PING G410 fairway woods feature a reworked CG that reduces spin. PING engineers have shifted the CG lower and slightly forward compared to the previous G400 fairway woods to provide more stability and nudge up the ball speed. The shallower maraging steel face has been made thinner for more flexibility to boost ball speeds while a permanent tungsten weight, pushed to the extreme rear of the sole, increases forgiveness. There are three PING G410 fairway wood models – standard, SFT and LST – to choose from. 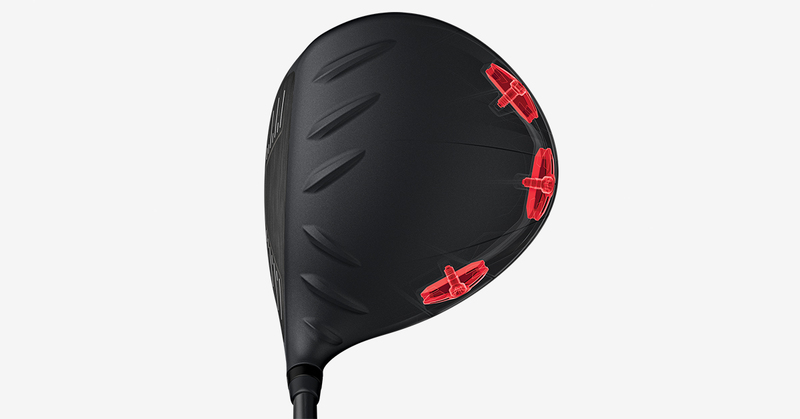 The SFT is draw-biased and has a slightly larger head to boost forgiveness, while the new LST is a lower-spinning and higher launching fairway wood compared to the standard G410 fairway wood. All PING G410 fairway woods are fitted with the same eight-setting adjustable hosel that features on the driver. The standard G410 fairway wood is available in 14.5, 17.5, 20.5 and 23.5 degree lofts while the G410 SFT fairway wood comes in lofts of 16, 19 and 22 degrees. The PING G410 LST fairway wood is solely available in a 14.5 degree loft. The new G410 hybrid is PING’s first to feature an adjustable hosel that offers alterations to ball flights through eight different loft and lie adjustments. Sporting a bigger profile and a tungsten back weight, the PING G410 hybrid flaunts a higher MOI for extra forgiveness. The PING G410 hybrid comes in lofts of 17, 19, 22, 25 and 31 degrees. A blend of a long iron and hybrid, the new PING G410 crossover has also been introduced. Based on PING’s hollow iron models, the G410 crossover features a sleek new body and its maraging steel face produces improvements in ball speed. Forgiveness has been increased through a larger 30g toe weight that boosts stability for off-centre strikes. The PING G410 crossover is offered in lofts of 17, 20 and 23 degrees. A top entry in the game improvement category, PING’s new G410 irons possess the look, feel and sound of a better players’ iron. More compact than the previous G400 irons and sporting less offset, PING G410 irons deliver faster ball speeds and more forgiveness. Weight savings in the redesigned face and cavity structure has enabled PING to insert tungsten weights into the heel and toe areas for an 8 per cent MOI boost. The rear of the G410 irons has been revised with the top undercut rail and cavity now working together to let the face hinge more, delivering faster ball speeds and a higher peak ball flight height that should make it easier to hold the green on approach shots. A cavity badge constructed from aluminium and a synthetic rubber reduces vibrations in the G410 irons and improves the impact sound. And to top it off, the wedges in the PING G410 set have been precision milled with a sharper edge radius for better contact and increased control and spin.